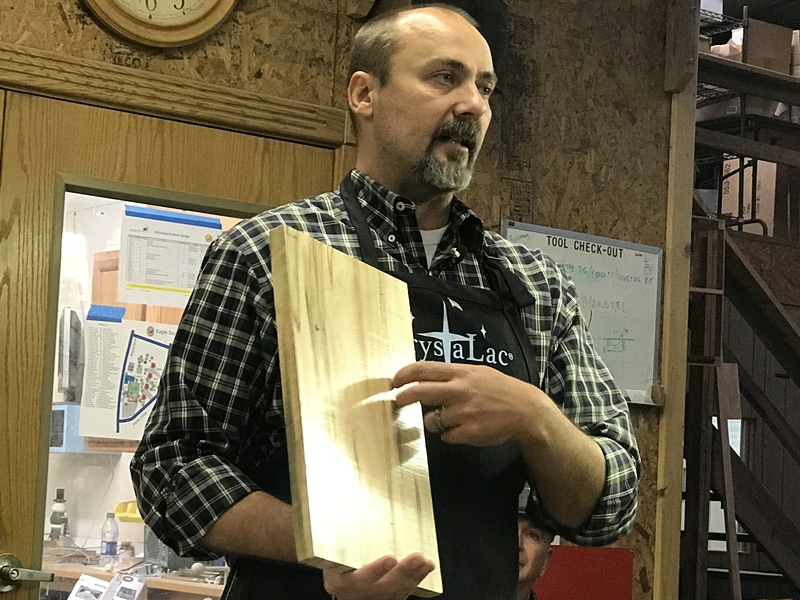 When our club treasurer, Bob McElfresh, was visiting the International Woodworking Fair in Atlanta this year, he was enamored with the presentation and finishing products from The CrystaLac Company. While talking with their representative, Dave Sheppard, Dave offered to come to our club and give us the same presentation. Dave also enlisted his professional woodworking friend, Lyn R. Walker to present the product to our organization. The CrystaLac Company was formed in 1989 in Mountain City, Tennessee. Mountain City is about as far North and East as you can go in Tennessee before you cross into Virginia or North Carolina. 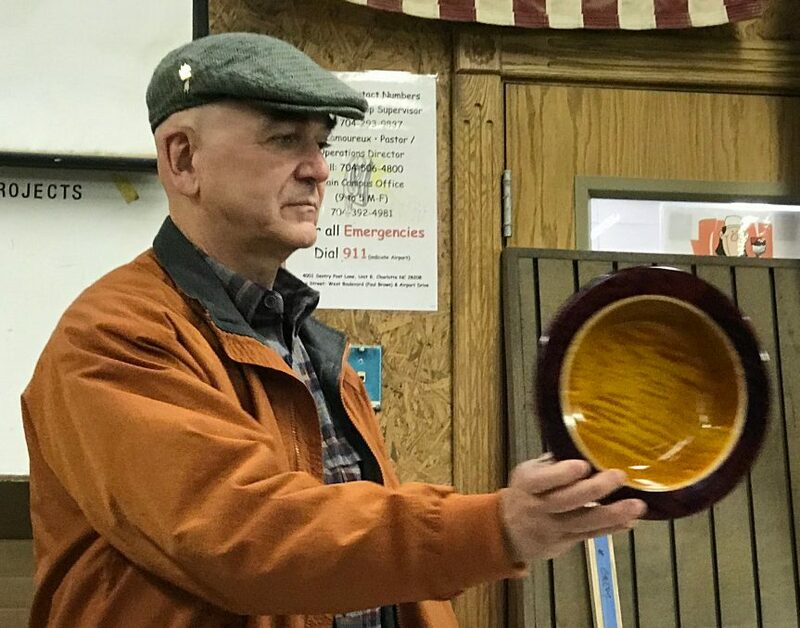 It’s a small town nestled in the hills along the Appalachian Mountains and an unexpected place to find a high tech company with a great finishing product. Dave, originally from West Jefferson / Lancing, NC, loved the company so much he put a ring on the owner’s daughter and made it official. He’s now traveling the country pitching the product and the business. 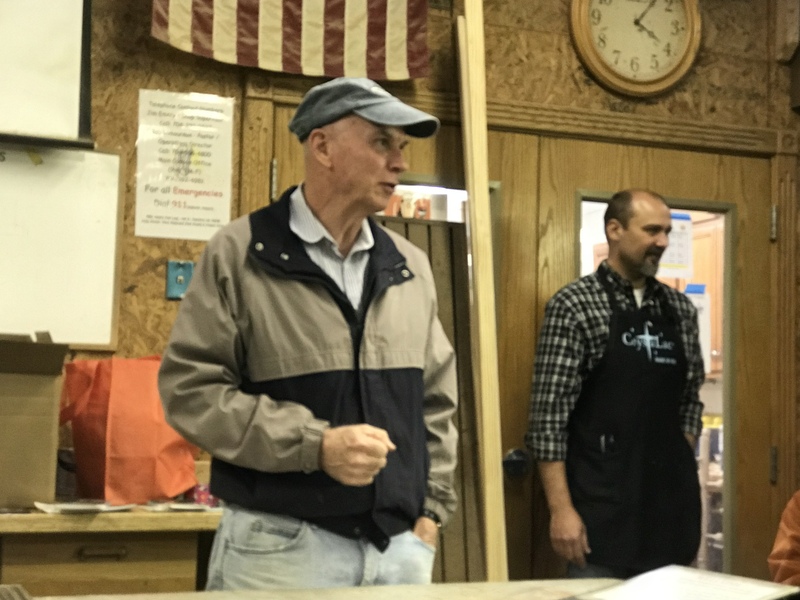 Dave’s father-in-law, Derek Becker, now 85 and “semi”-retired started the business by making a boat finish after having worked for a number of different finishing product companies including Dupont. He grew the family business with a focus on a high quality product and great customer service. This past year, Dave’s wife and Derek’s youngest daughter, Dorinda, purchased the company from her father and is now leading the company forward. This is a family business through and through, but this small family owned and operated company from a small town competes well above its weight class on the world-wide stage. They have customers, big name customers, and are working with some large distributors, but maintain a low profile. Luthiers and wood turners love their products because of the high gloss high sheen finish. Even the Smithsonian uses their products in restorations. It’s put on everything from fingernails to Dinosaurs. Martin Guitars has used the grain fillers for years. 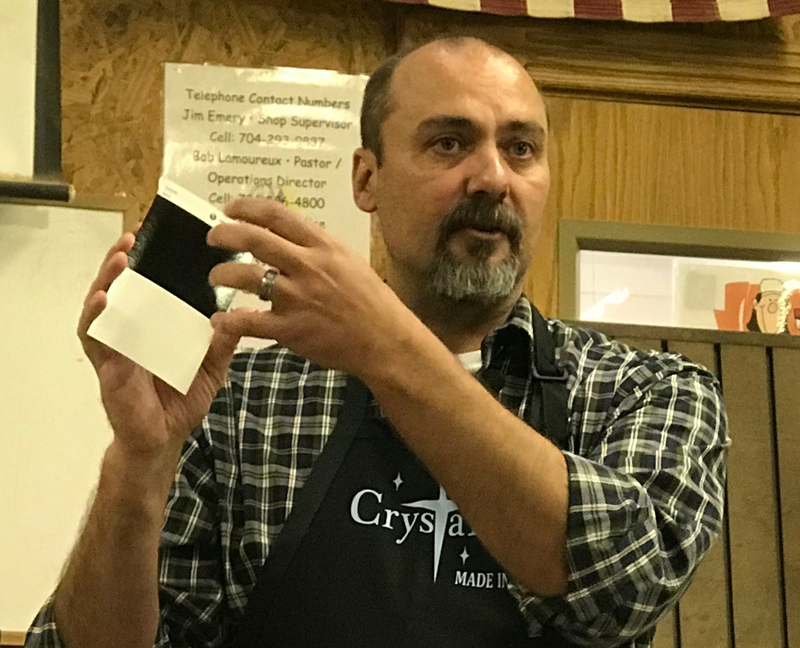 Woodcraft, StewMac, McFeely’s and Amazon sell their products, but the best place to buy it is direct from The CrystaLac Company on their website: The CrystaLac Store (https://thecrystalacstore.com). The CrystaLac Company focuses on water based finishes. You won’t find oil in their mix. 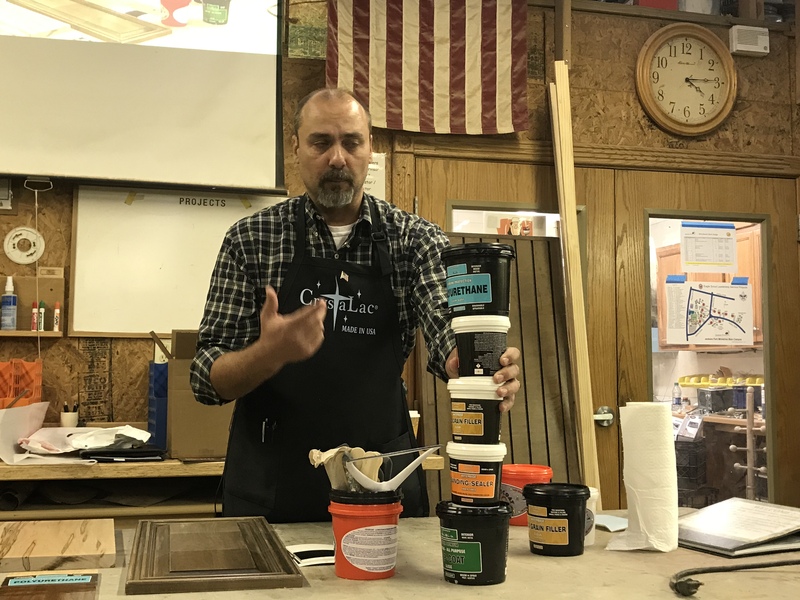 The product line is meant to be a finish that can be used together and applied, in some cases with all of the coats from sanding sealer to the final finish in one day. One can even change the order of the applications if needed to achieve the desired final finish. Their products are self leveling and can be applied with a simple foam brush or sprayer. According to Dave, the key to a great finish is to apply several thin coats of the product with a 2 hour dry time between coats. If it’s done properly, you’ll be able to eliminate several steps in the typical finishing process and shorten the time invested. The best finishes are stirred, not shaken. As a water based product, we don’t want air bubbles invading the finish. CrystaLac products use only the best quality resins. They also are some of the most environmentally friendly products. They have no or low odor and less than 1 gram per liter of VOCs (volatile organic compounds) in their products. By comparison, California has some of the toughest VOC regulation in the country and requires less than 100 grams per liter. All of CrystaLac’s finishing compounds are self leveling. To demonstrate this, Dave applied his finish to a self leveling strip that’s used in the industry to measure the self leveling quality. The room was pretty dusty, but in spite of that the test demonstrated a consistent layer of the finish. Before beginning any application it’s very important to start with a clean and dry surface with no oils. If an oil based product (or wax) is already on the wood, it must be completely dry before applying any of the water based CrystaLac products. You can apply the product over oil based products, but you may need to rough up the surface first. CrystaLac forms a bond with the wood and it needs something other than wax or oil to bond. Sanding sealer may be applied directly to the wood. Because it is a water based product depending on the type of wood, there may be some sanding required afterwards due to the grain raising. Typically this is minor sanding, but it’s important to clean the surface of dust prior to subsequent applications. CrystaLac also makes a wood grain filling product. Wood grain filler typically after the sanding sealer. It’s easy to use and can be applied with fingers to rub into the grain and then squeegeed off or rubbed off with a damp paper towel. 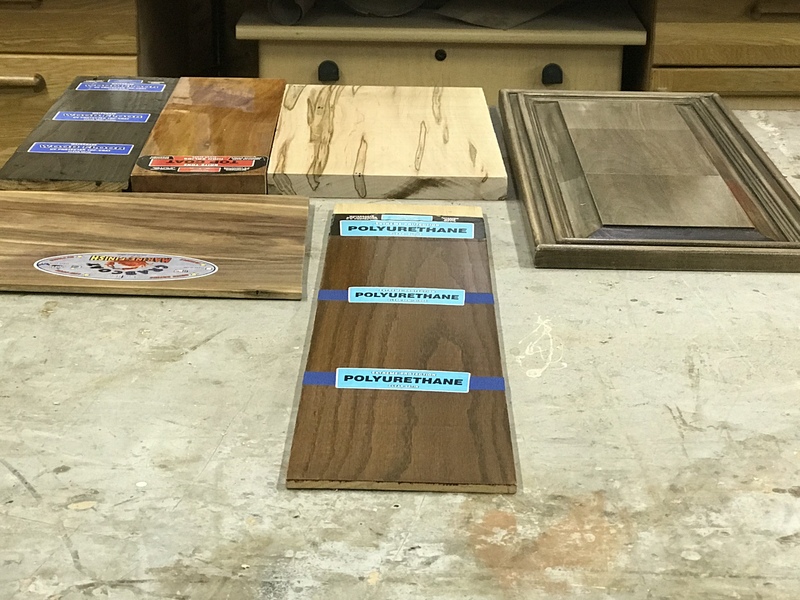 Typical applications of grain filler require 2 or three coats, but given the ease of application, clean-up, and quick drying time (2 hours), and the ability to apply finishing products directly on top of the wood grain filler, the process to a final product is very fast. Some of the CrystaLac products have an amber tint added so be sure to test your finish before using it on your final piece. The amber tint adds an aged look to some woods and looks great on floors such as Teak. TopCoat Super Premium is where it all started for Crystalac. This is a polyurethane acrylic blend. None of their products will water spot or have issues from having a hot pizza box sitting on them. You can apply as many coats as you want. Layers do make a difference. It’s recommended to apply a minimum of three coats with 3 hours between coats using thin light coats. It’s important to keep fingers and dust out of the finish and no sanding is required between coats to achieve a superior result. The products are food & child safe and is commonly used for bowls. Dave recommended starting from the beginning and testing the finish it all the way through all of the products. If it doesn’t look right, then call the company. They will address any questions you have with the product. The Extreme Protection Polyurethane is made for high traffic areas such as restaurant tables, brass kick plates, etc. It is UV protected. Application is simple as it is water thin and can be sprayed or brushed right out of the can. All products have 5 year shelf life guarantee as long as you don’t let it freeze… even if it’s opened. All products will typically take three hard freezes, but it’s recommended to store them above freezing. Typically the product needs one day cure time per coat. 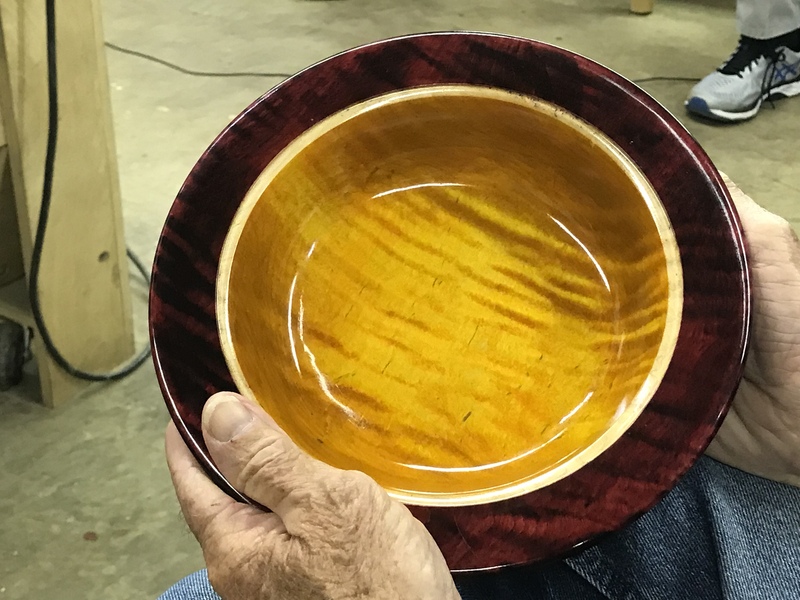 According to Lyn, the bowl (pictured below) has only 5 coats of finish with no buffing or polishing required. This was applied while still on the lathe using a foam brush. When using any sandpaper on the wood, DO NOT USE STEARATED sandpaper. It contains wax which will transfer onto the wood and prevent the finish from bonding properly. Use only non-stearated sandpaper! The Crabcoat Marine Finish contains a UV stabilizer and fungicide making it ideal for outdoor applications. A four coat finish gets a minimum of 2 years of wear outside. For maintenance, pressure wash and clean every 2 to 3 years and apply a fresh coat of the finish. This product is used on boats and kayaks, etc. It is important to let this cure for 30 days prior to immersing in water (for all CrystaLac products). Brite Tone Top Coat is primarily an Instrument finish. It’s used all over the world by luthiers. It’s nearly 100% resin, UV protected, and can set in window without discoloring the wood. Typically it’s applied with 4 or more coats. To clean a finish, simply use a damp cloth and dry towel to repair. The flooring finishes are Polyoxide, UV protected, and contain Aluminum Oxide. It is extremely durable and resilient. The product descriptions, preparations, application, and dry times are available here: CrystaLac_master_catalog_11_27_2017 and on their website at http://www.crystalac.info/faq.html. A special thanks to Dave Sheppard and Lyn Walker for coming and presenting to our organization.